A young girl has lost her father. All she has to tell her why is a photo of his former associates, whom she blames for his death. This girl is different, however. She has been trained as an assassin, and now she plans to use that training to exact her revenge. 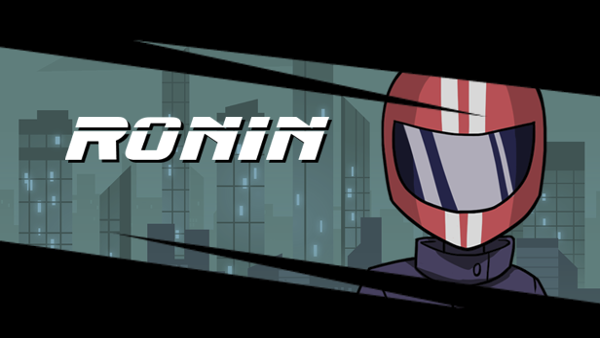 This is the setting for RONIN, a new game by Flying Wild Hog. You may remember the interview I did with designer Tomasz Wacławek after getting a chance to try the game at PAX South at the Devolver Digital booth. I had been looking forward to playing the game ever since, so I was very excited to get the code from Devolver and get to sink my teeth into it. When you first fire up RONIN, it is hard to escape the comparisons with Gunpoint. The graphics are very similar, and you are controlling a character who sets jump trajectories using the right analog stick of a controller and has many different skills and gadgets to aid in her quest for vengeance. It does not take long, however, for the differences between the two games to start to stand out. 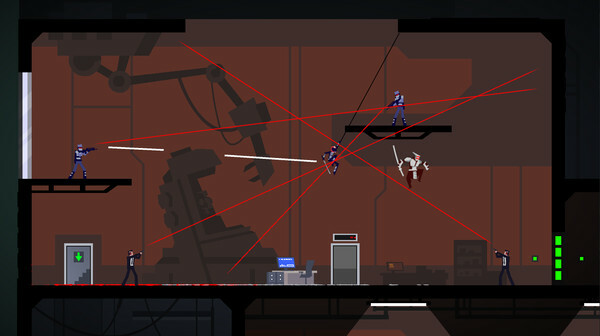 Unlike the earlier game, RONIN is not a game about stealth, though remaining undetected as much as possible is can definitely help eliminate all enemies in a level. 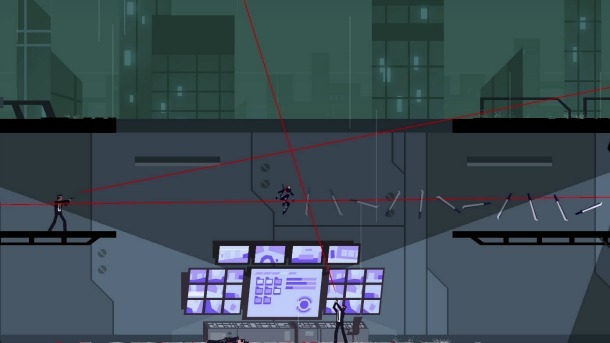 RONIN follows a pretty standard progression: you must gather intel on where each of your targets is hiding by hacking different computer systems in two different locations. After this intel has been gathered, you assault the location itself, with the ultimate goal of killing the target and making your escape on your motorcycle. Standing in your way are guards armed with both hand guns and sub-machine guns, swordsman who can launch themselves at you and must be approached with caution, civilians who will panic if they see you and call for a security lockdown and various environmental obstacles that can both hinder you and, if approached correctly, actually help you out. RONIN’s turn based combat is rather unique. You start out this quest armed only with your sword and grappling hook. 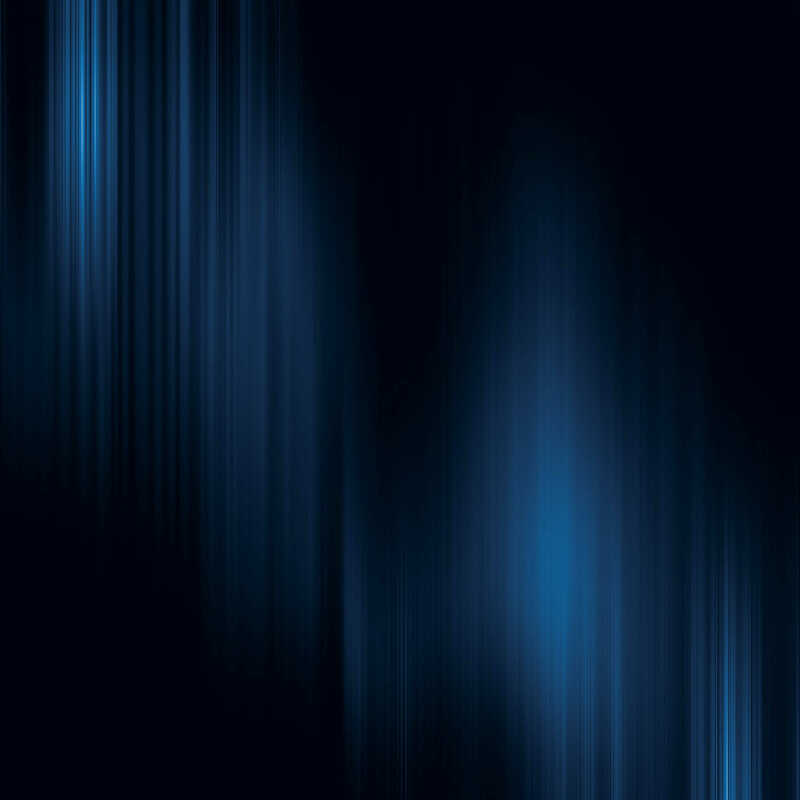 Using them, you must make your way through the various levels to meet your various objectives, whether they are gathering intelligence or eliminating your targets. Along with your primary goals, each level will have three secondary goals: eliminate all enemies, spare all civilians and avoid triggering a lockdown. If you complete all these goals, you get a skill point to spend toward various skills and gadgets that will greatly help, including the ability to perform stealth kills when hanging on the ceiling above an enemy and to drop a decoy for distraction. While the secondary objectives are easy to achieve in the early levels, the difficulty can spike on these objectives very quickly, making earning that much needed skill point a sometimes frustrating experience. So now that we have the basics of the game down, we can take a look at what is both the most intriguing and most frustrating part of RONIN: the controls. As I mentioned earlier, navigation in RONIN is very similar to that in Gunpoint. You move around the levels using the left analog stick and initiate jumps with the right. You also have a grappling hook that can be used pull you to wherever it connects, change your jump trajectory or swing across gaps. You incapacitate and opponent by landing on them, jumping through them or using one of your skills that is specifically designed to stun them. One of my favorites for that was Shuriken Rain, where you threw shuriken at all opponents, stunning all but swordsmen. Kills are achieved by getting close enough to the enemy to strike him down with your sword, unless you unlock the stealthy kill ability or the ability to throw your sword at an opponent. Of course, if you choose to do the latter, you will have to retrieve it before you can kill someone else. That is part of why I did not throw mine until I had Sword Recall unlocked. To throw the sword or not to throw the sword. That is the question. While unlocked skills will help you turn the tide of battle, you do not get to use them anytime you want. You have to build up to them by stunning or killing opponents. Do enough stuns, kills or skill uses in a row, and you will reach Limit Break, which will allow you to perform an extra move in a single turn. That can be very useful. As you progress through the game, combat becomes more treacherous, both due to more enemies being thrown at you at a time and environmental obstacles limiting your ability to maneuver. While you would expect that to happen in a game like this one, one serious but not quite fatal flaw makes this progression extremely difficult: the jump mechanic does not always work. One of the hints given to you in this game is the Jump Arc is a lie. This hint pops up from time to time to remind you that the arc you see when lining up a jump will not always be the path your character will take. Sometimes the reason for this is obvious; when you hit someone mid-jump, you would expect your trajectory to change. Sometimes, however, the arc is wrong because the controls do not work as intended..
As I mentioned earlier, you use the right analogue stick to set your jumps. The idea is you rotate the stick to set your trajectory and then release it to actually jump. This sounds like a great way to handle movement, and when it works, it is. The problem, however, is I often found myself setting my trajectory and then having it change when I released the stick or having nothing happen at all, forcing me to try again. Sure, sometimes the change to my trajectory was minor, but as you get further into RONIN, the difference between living and dying after a jump can come down to a matter of just a few pixels, meaning a slight change of trajectory could mean instant death and the need to restart from the last checkpoint. Combat situations like this would have been a lot less frustrating if I was not fighting the controls. The jump trajectory was not the only problem with combat. Another game hint tells you that pressing the right analog stick will cancel your current jump trajectory. This can be very important, because you might realize too late that your next move should be using a skill as opposed to jumping. The problem is, this failed me so many times that I began to think it did not work at all. Now I was not playing this game with a standard Xbox 360 controller; I have the Power A Fus1on Tournament controller I use for PC gaming. While that may have lead to some of the control difficulties, I overall tend to find this controller handles better than the standard 360 controller. As Flying Wild Hog could not be certain players would be using the official 360 controller, an alternate method of jumping once you have set your trajectory would have been welcome, such as hitting a different button on the controller or maybe pressing in on the right analogue to trigger the jump. The frustration with the controls get magnified as you try to achieve the three secondary goals to unlock new skills. Avoiding detection by civilians, for example, is much harder when you cannot be certain of your jump arcs. To be honest, I found the secondary goals to be almost impossible on certain levels, and I enjoyed the game a lot more when I stopped trying to complete all three on all levels. Yes, it means I did not unlock all the skills on my first playthrough, but it was more enjoyable, and I can try to complete those goals on the other levels on the New Game + playthrough if I so choose. At one point while playing RONIN, I voiced some of my frustrations with the controls on Twitter. One of my followers commented on how the game was frustrating him, because it seemed to only allow for one right way to approach each level, Having beaten the game, I find I have to disagree with this criticism. While controls not working quite as they should and sometimes severe spikes in difficulty can get frustrating, I do appreciate that Flying Wild Hog deigned the levels in such a way to give the player choices on how to approach them. These choices are further expanded by unlocking skills. For example, one of the skills I unlocked while playing was the Shadow Strike, which allowed me to teleport to an enemy and send them flying, stunning them in the process. If an enemy enemy was standing close to an environmental hazard, I could use this skill to kill them as well. It’s features like the unlocked skills that really add a level of strategy to this game, making it a game that, while frustrating, is still worth playing. If you enjoy challenging games and are willing to deal with a few flaws, RONIN is for you. The combat in RONIN can be a little hard to describe in words. If you want to get a better idea of what it looks like in action, take a look at this trailer. This entry was posted in PAX South 2015, PC, Post, Reviews and tagged Devolver Digital, Flying Wild Hog, PAX South, review, Ronin, Turn-based combat. Bookmark the permalink.